One of the biggest events in the UK Design Calendar is the London Design Festival. Taking place over nine days, it’s a chance for the crème-de-la-crème of the London Design scene to reveal fresh new looks and launch new products. Taking place this year from 17th – 25th September, all across London top designers are holding exhibitions, installations, showroom openings and taking those window. The LDF is the perfect opportunity to get everyone interested in Design, and you should therefore expect to see many interactive and dazzling displays popping up all over the city. The highly anticipated start to the Festival is Decorex International, hosted this year at the historically beautiful Syon Park. Celebrated as showcasing the best of luxury design, every one of the 400 exhibitors have been handpicked so you’re guaranteed to only see the very best London Design has. designed by 1508 London with the help of Atelier Alain Ellouz. 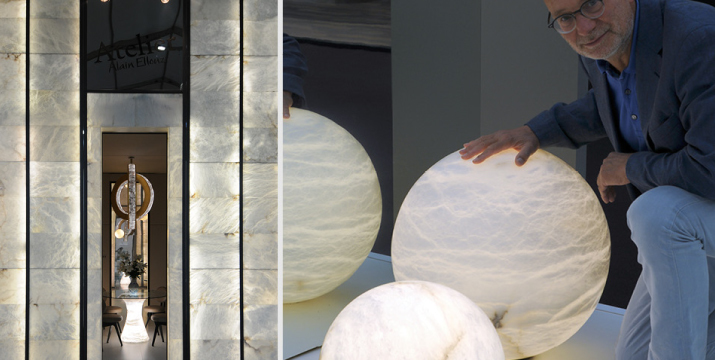 A French designer specializing in luxury design, Atelier Alain Ellouz is the only world specialist in backlit alabaster and rock crystal. 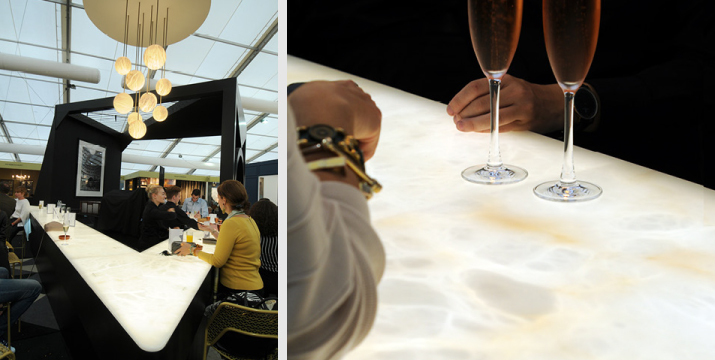 For the champagne bar, he provided his signature backlit alabaster panels and an alabaster luxury chandelier. Both the bar and contemporary chandelier were excellently received at Decorex, and were. Atelier Alain Ellouz also showcased a monumental alabaster tower. 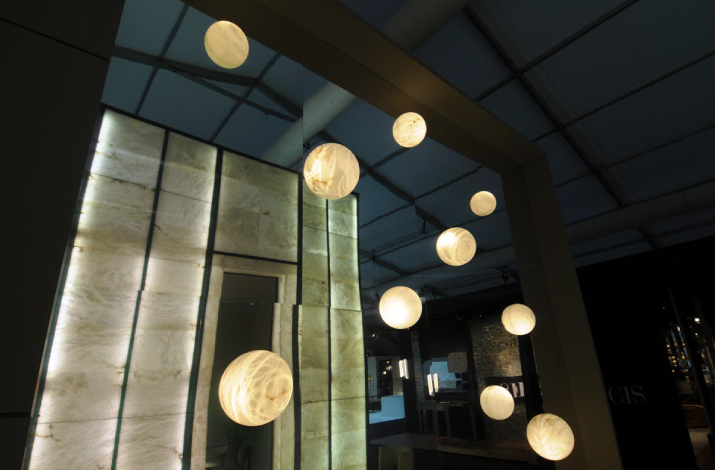 Inside the light column was a simple yet beautiful alabaster table with a glass top, and a luxury chandelier featuring a modern design of two rock crystal discs entwined, giving off a lovely soft light into the space. There was also a wall of mirrors, adorned with light spheres. This not only reflected the impressive alabaster tower but the light spheres reflected in the glass appeared whole, creating a beautiful effect mesmerizing to behold. Atelier Alain Ellouz’s luxury home furnishings are typically backlit to reveal their natural patterns and veins, creating a completely unique look which made the perfect centerpiece to Decorex.Working with alabaster is much like working with wood: alabaster is a relatively soft stone, and can be easily molded and shaped into multiple forms, in surface and in volume. As with traditional woodwork, alabaster luxury furniture is made by hand and each creation takes weeks to perfect. In contrast to machine-made designs, each of Atelier Alain Ellouz’s alabaster creations are beautifully unique and lovingly, skillfully made.